There are two major designs in liquid ring vacuum pumps. They are cone ported and flat sided. The smallest pumps are usually flat sided, as they are easier to manufacture. The largest vacuum pump commercially produced is cone ported, as it is most efficient and handles excess water better than a flat sided pump. The liquid ring pump is a constant volume device. The maximum volume is determined by the void space in the rotor (the “bucket volume” times the number of buckets). The throughput of the pump, however is less than the void volume because it takes a finite amount of time to move air into the bucket and to exhaust the air from the bucket. It is also less than the maximum volume because of leakage from bucket to bucket caused by the pressure differences. Both pump designs operate on the same principle. A multi-chambered rotor is placed eccentrically in a pump body. A sealing fluid is introduced and the rotor spun to produce by centrifugal force a liquid ring of roughly constant thickness on the inside of the pump body. Because the rotor is placed eccentrically and has multiple chambers (which are commonly called buckets), the liquid almost completely fills the chamber on the discharge side of the pump, and almost completely evacuates the chamber on the intake side of the pump. So the gas being processed is drawn in when the intake valve opens, is compressed by the advancing sealing fluid with both the intake and discharge port closed, and is expelled when the discharge valve opens. Finally, with both ports closed, the chamber must move from the discharge to the intake position, through a zone called the seal point. There is only one moving part, the rotor. 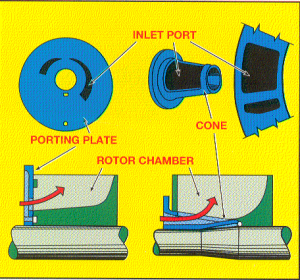 The intake valve is formed by the rotor moving the bucket past an opening from the rotor to the intake port, and the discharge valve is formed by the rotor moving the bucket past an opening from the rotor to the discharge port. The sealing of the boundaries is caused by a very close clearance (three human hairs) between the rotor and the material around the openings. In both pumps the rotor chambers are open on the outer circumference to allow the sealing fluid to easily move in and out. In the flat sided pump the inside of the rotor is sealed, and the buckets are open on the end of the pump. The openings for the intake and discharge are thus in a flat plate on the ends of the pump. This design has the advantage of being easy to make as the end of the rotor and the plate can both be machined flat, and easy to assemble. The clearance between the rotor and flat plate is determined by shimming, with the clearance a one to one relationship to the shim. One one-thousandth of an inch shim will decrease the clearance by one-one thousandth of an inch. The disadvantage is that the size of the opening to determine how fast air can be moved in and out is limited by the bucket cross-section. In the cone ported pump the rotor is sealed on the ends and open on the inside. To form the valves a two chambered device is inserted into the inside of the rotor, and to control the clearances the device is conical with the inside of the rotor machined to a matching taper. The clearance is again determined by shimming, however in the conical design with an 8 degree taper seven thousandths of an inch of shim creates one-thousandth of an inch of change in the gap. It is thus easier to control the gap and have better pump sealing. There are two advantages to this design. First, the port size is about five times as large as the port in a flat sided pump. Second, the air enters into the bucket and exits the bucket without turning as it has to in a flat sided pump. The water droplets entrained in the air thus continue through the pump without falling out enabling the cone ported pump to handle a much greater volume of excess water. The biggest challenge with this design is to control the shaft deflection so the gap is even as the pump turns. This problem is cured with a very large shaft. A second issue is that of damage to the cone and matching rotor should a bearing fail. We have cured this problem with the use of a secondary bearing in the unlikely event that the primary bearing fails (usually due to lack of lubrication). While we don’t recommend it, one of our customers ran our pump on the secondary bearing for a month waiting for a down. The flat sided pump is usually lower capital cost. You will pay a penalty in increased power consumption, increased seal water consumption, and intolerance of the pump to excess water in the case of an upset. For an economic analysis, give us a call.